We moved from Austin to Minneapolis when I was six months pregnant with our first child, Leo, who is now a junior in college. He was born the day before Thanksgiving as the snow began to fall. It didn’t take me long to realize that I needed to find indoor escapes to survive the dark arctic months with a new baby, and as a recent transplant, a limited friend list. We lived in a neighborhood called the Wedge, in a second floor duplex near the Minneapolis Institute of Art. The museum immediately became my go-to place to take Leo. I’ve always loved art museums, as much, if not more, for the building and their sublime interior spaces. The Institute is a stunning merger of the original neoclassical building with several minimalistic expansions. All visitors pass through a huge open entrance that connects the historic with the modern. 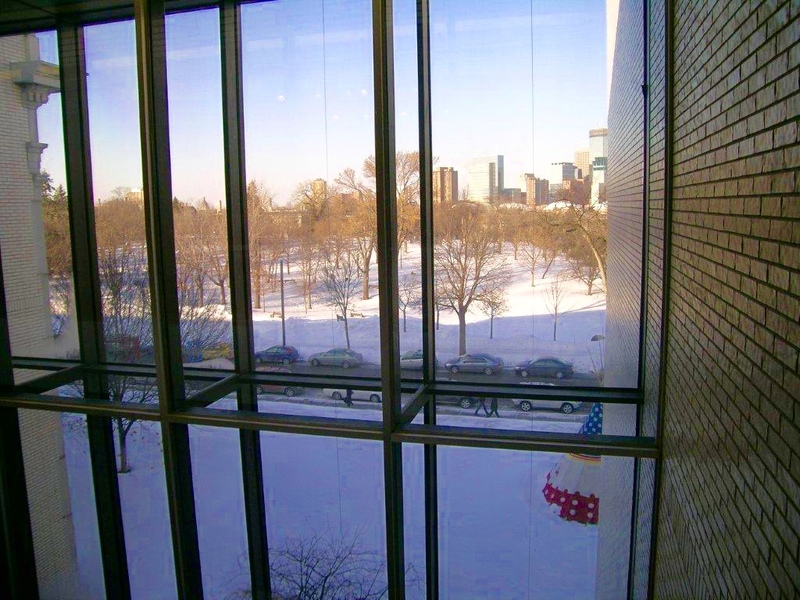 The space is a perfect balance of clean lines, beautiful wide-stepped staircases, and an enormous wall of windows showcasing the Minneapolis skyline in the distance. Because it’s the transitional area between the galleries, there’s a collage of works from various cultures and periods. The normal museum rules don’t apply. It’s designed as a place to meet and talk. As Leo got older and began walking we sometimes would never leave this entrance. For hours, I would follow him up and down the stairs. He would run around the protected statutes and pause to watch people across the street in the park. Leo was like a tiger cub, cute and playful when he was baby, but then his need for stimulation became almost insatiable. By the time he was two it was becoming apparent that he needed to be out in the wild with his big paws and newfound strength and volition. I can remember exactly what he was wearing on the day that he outgrew the museum: red thick sweatpants, a horizontally striped shirt of primary colors, and wide square-looking velcro sneakers with the same bright pattern. Matthew and I had taken Leo to the Institute on a cranky Sunday morning. It had been snowing for days and the museum was particularly quiet. Leo was fidgety but started his usual routine of climbing the stairs while singing and talking to himself. I noticed he had a look that I didn’t quite recognize. He wandered over toward the entrance into the modern wing. Matthew and I were leaning against the wall of windows. I looked over and immediately identified what previously I could not name. In real time, my tiger cub transformed into a bull. This is when my memory goes into slow motion. Leo returned my stare and I swear his nostrils flared. He started running full speed, with all the pent-up frustration that he brought with him to the museum. Hands out straight in front of him, he was heading toward the wall length canvas on the other side of the room. I don’t remember the artist but it was one of those towering Rothko-esque pieces. The visual that remains in my mind is of a candy apple red rectangle baiting the approaching bull. Matthew and I pierced the silence with our screaming pleas for him to stop, but our feet felt paralyzed. The guard in the corner was equally stuck to the floor, his mouth open. The three of us glanced at each other and then back at Leo on his determined course. He never slowed down, not for a moment. He was a blur of color bolting across the room toward the perfect stillness of the equally colorful canvas. We all knew that he was going to make contact. My pulse quickened, with the certainty that our financial ruin would begin that morning. Fear gave me magnifying vision that zoomed in on his chubby, sweaty toddler hands as they hit the painting about four inches from the bottom. I saw the canvas give and then shut my eyes. The contact was so powerful that Leo was knocked back and staggered, but the bull did not fall. Matthew, the guard, and I had finally unglued our feet and were kneeling next to Leo, scanning the painting for damage. No holes. No indentations. No grimy hand prints. I was waiting for alarms to ring and an army of museum secret service to swarm, all the while worrying that the painting might still explode or fall off the wall in an aftershock. The guard half-heartedly admonished us and let us leave without filing a report or even taking our names. There was an unspoken mutual relief at our miraculous good fortune. It’s hard to believe that moment was twenty years ago. It has become the anchoring reference point for our extensive, and growing, list of ridiculous parenting situations. What we didn’t know at the time was that the incident at museum captured everything we ever needed to know about parenting but took two decades to learn. Each child comes into this world with a unique temperament and plan of their own. Your children will do and say things that that you can never prepare for or fully understand. The best we can do as parents is to shout out directions from the sidelines–sometimes your kids will hear you, but most often not. You have to be willing to improvise when helping to pick up the pieces, even when you’re scared. Mercifully, most of the close calls are just that, and there’s the gift of another day with another chance to get it right.